Since its organization in 1821 with just four members, the Central Presbyterian Church had a history of outreach. The original church was erected on Broome Street near Elm. When hordes of men headed West during the California Gold Rush of 1849, the Central Church members recognized that the miners would arrive in a wilderness with no spiritual guidance available. According to Frank Leslie’s Sunday Magazine later, they “during the gold fever in California, sent the frame-work of a church, in sections, by ship around Cape Horn for the Rev. Dr. Willets, who was a missionary and former teacher” in the Sabbath-school. When the Central Presbyterian Church burned down in 1854 it was quickly rebuilt. 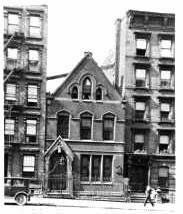 Then in 1866 the congregation moved uptown to West 57th Street between Broadway and Seventh Avenues and a new church was completed in 1878. The church did not entirely give up the old neighborhood completely. A chapel, called the Mizpah Chapel, was opened in a Broome Street basement in 1868. Only a few blocks to the west of the new church was the notorious and dangerous Hell’s Kitchen neighborhood. It was rife with crime, vice and poverty and did not escape the notice of Central Presbyterian Church. To church members it fairly cried out for a mission chapel. In 1880 the Mizpah Chapel moved into a tenement apartment on 10th Avenue, in the very midst of the slum. Many of the impoverished immigrants embraced the chapel, called by The New York Times “a mission enterprise of the Central Presbyterian Church.” Theological students took the pulpit during the formative years; yet the New-York Tribune noted in 1886 that “no Sunday has passed without a service.” It was quickly apparent that the rented room had became inadequate. In 1884 an anonymous member offered $5,000 to build a new Mizpah Chapel (the Hebrew word means “watchtower”). He was trumped by a trustee, Samuel Inslee. In 1885, “seeing the need of a suitable house of worship, he bought the lot No. 420 West Fifty-seventh-st.,” reported the New-York Tribune a year later. In December The Manufacturer and Builder reported “A two and a half story mission house is to be built at 420 West Fifty-seventh street, at a cost of $14,000.” The Real Estate Record & Builders’ Guide called the proposed building “a small place of worship” and described the façade as “being of Philadelphia pressed brick and brown stone.” The relatively small structure, just 25 feet wide and 80 feet deep, the journal noted that it was being designed by architect S. A. Warner. By the summer of 1886 the handsome little building was complete. Warner had produced a charming Gothic structure endearing in its simplicity. Red brick was trimmed in brownstone and sat on a rough-cut stone foundation. A projecting stone portico sat two steps above the sidewalk. Warner’s design was accentuated by brownstone band courses. His simple mission chapel would not intimidate the 500 underprivileged worshipers which the chapel could accommodate. Despite the unpretentious façade, the New-York Tribune noted that the total cost of the building and lot had risen to $28,000—more in the neighborhood of $715,000 in today’s dollars. It was all paid for by Samuel Inslee. “While Mizpah never takes a vacation, but through summer’s heat and winter’s cold no interruption has been had to the services of Sabbath School, preaching, and devotional meetings during the nine years that we have conducted the work, yet many of the teachers and scholars are absent from the city some portions of the summer. The ministers of Mizpah Chapel went beyond mere preaching. They recognized the plight of the Hell’s Kitchen population and actively worked to improve it. Such was the case in March 1903 when Rev Irving P. Withington spoke on the subject of Child Labor at the request of the Child Labor Committee. Samuel Inslee’s influence on Mizpah Chapel was felt even after his death. When his widow, Helen C. Imslee, died in her mansion at No. 50 West 72nd Street in 1908 she left an impressive estate. Paintings were bequeathed to the Metropolitan Museum of Art, and large sums were willed to various charities. Among them was Mizpah Chapel which received $5,000; a generous donation. As a way of attracting street-tough boys to the church, and hopefully keeping them away from the lures of crime and vine, the Chapel organized athletic teams. On January 14, 1914 the Princeton Alumni Weekly reported on a basketball game between rival teams of the West and East Sides. The hard-edged character of the players did not go unnoticed. If the teen-aged boys in the neighborhood were a bit rough; their mothers were not push-overs either. On the afternoon of December 13, 1922 a group of women were singing “My Faith Looks Up to Thee” in the Mothers’ Bible Singing Room of the Mizpah Chapel. The pastor’s wife, Mrs. C. R. Truby, played the piano. Suddenly fire broke out in a flue connecting the Singing Room to the Class Room on the ground floor. The sexton, Charles Cadley, dashed out of the building to ring a fire alarm. The women were here to sing hymns and had no intentions of being interrupted by a mere fire. In 1929 Central Presbyterian Church moved once again, this time to Park Avenue and 64th Street. Mizpah Chapel remained on West 57th Street, where it was most needed. The following year, on November 30, a set of memorial windows to Anna C. Bush was dedicated. The non-denominational Church of the Strangers was begun “to provide a spiritual meeting place for Southerners.” It was paid for by Cornelius Vanderbilt. Mizpah Chapel, only a block away, opened its doors to the now-homeless church. The very next Sunday The Church of the Strangers held its 11:00 services in Mizpah Chapel. It was the beginning of a coexistence that would last several years. On November 15, 1947 it was announced that Mizpah Chapel had been organized into an independent congregation. No longer a chapel of Central Presbyterian Church, it took the name of Trinity Presbyterian Church. The little church continued to serve the Hell’s Kitchen neighborhood throughout the 20th century. Its willingness to adapt and its genuine West Side personality was evidenced on Saturday November 22, 1975 when the Society for Animals’ Rights presented “films, lectures and demonstrations of dog tattooing” in the building. That material weakness is evident in the façade of S. A. Warner’s time-weary 1886 Mizpah Chapel. Amazingly the unbroken history of Trinity Presbyterian continues in a charming relic of days when a mission was necessary in the depraved section.